It’s quite beautiful to see the bamboo trees like that. If you find yourself being turned off by the huge crowds at the Arashiyama Bamboo Forest in Kyoto, don’t be. 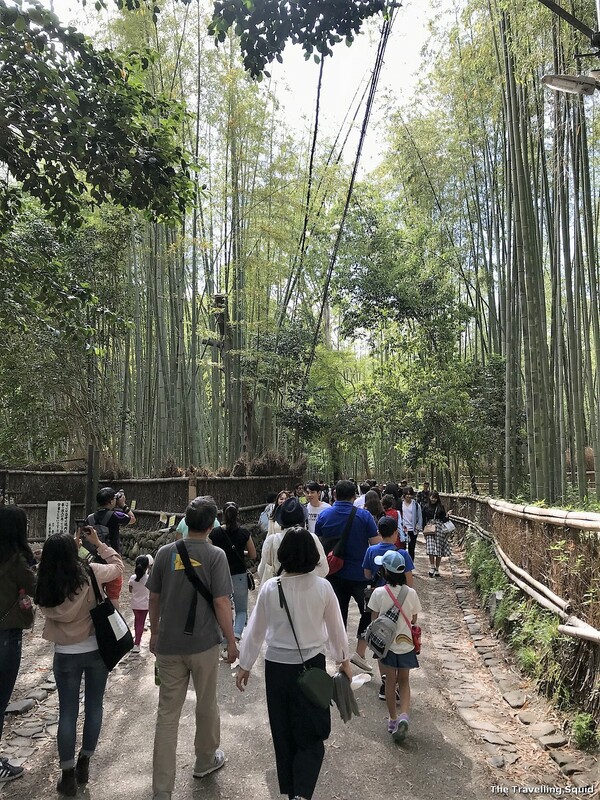 We visited the bamboo forest in May and the weather was perfect. It wasn’t too hot and the sun rays streamed through the bamboo branches. There was a huge crowd of visitors in front of us, walking through the path at a leisurely pace. I wished to have the place to myself, but the crowds did not make me feel uncomfortable. Don’t be turned off by the tourists. My main takeaway from the visit is that the bamboo forest is huge – you will be able to find some place to yourself if you look hard enough. 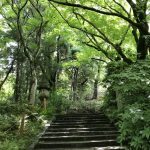 You may not be surrounded by drooping bamboo branches, but instead, by dozens of native Japanese trees and plants. For me, that sufficed. 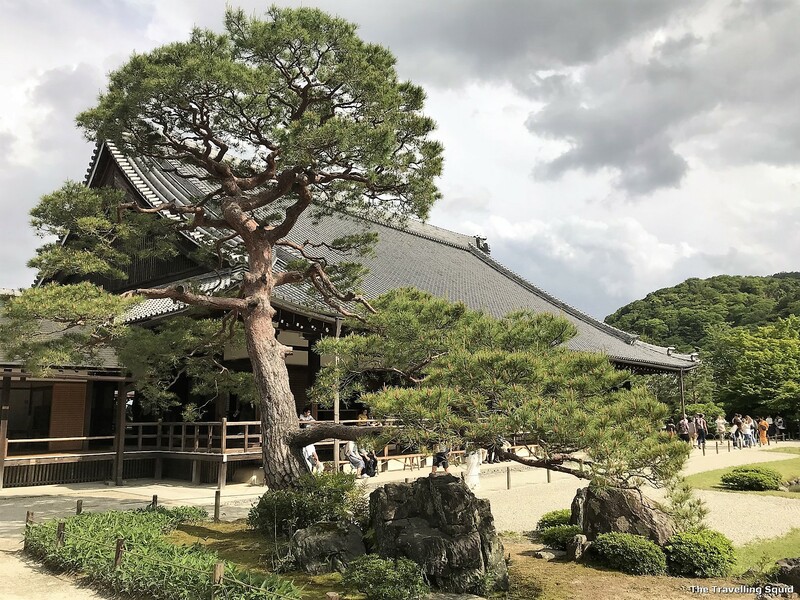 Before we go into the recommended walking route, here are five things to know about the Arashiyama Bamboo Forest in Kyoto. The well-pruned garden. Possible the resting place of many birds and small animals. The soundscapes are a selection of everyday noises intended to encourage people to stop and enjoy the sound’s of nature. 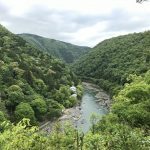 I can see why this is so because if you manage to find a quiet spot to yourself while in the Arashiyama Bamboo Forest in Kyoto, you’ll be able to hear the sounds of birds and insects in this nature park. An InFERNo – a gathering of ferns. I really like this picture. It’s possible to find some empty spaces in the nature park. 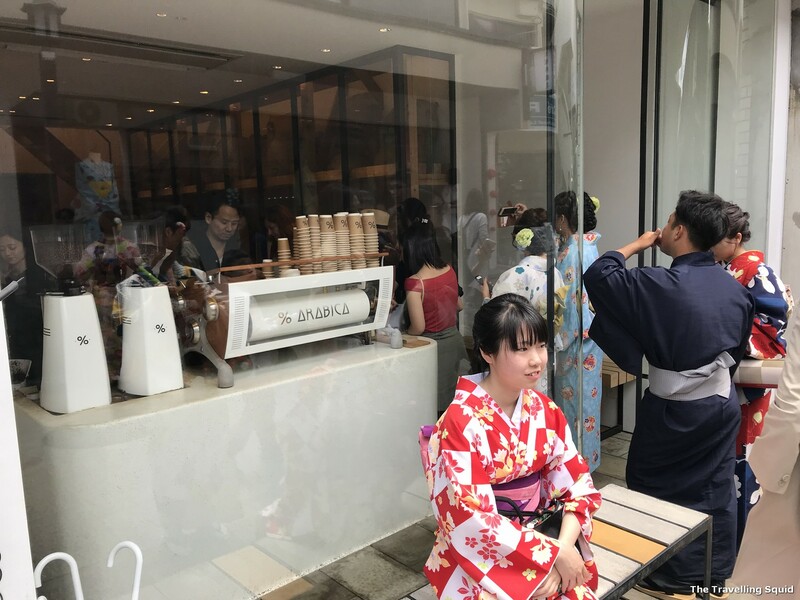 According to this CNN article, most people tend to visit in April, during the cherry blossom season, and during the fall, when the tree leaves change to reddish-orange. To avoid the crowds, visit during the early morning or later in the evenings. 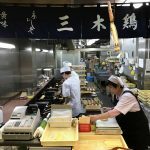 Weekends are particularly crowded due to visits from those taking day-trips around Kyoto. Steps up the hills. It’s actually pretty secluded here, because there are no bamboo trees. Never seen a garden so Japanese. 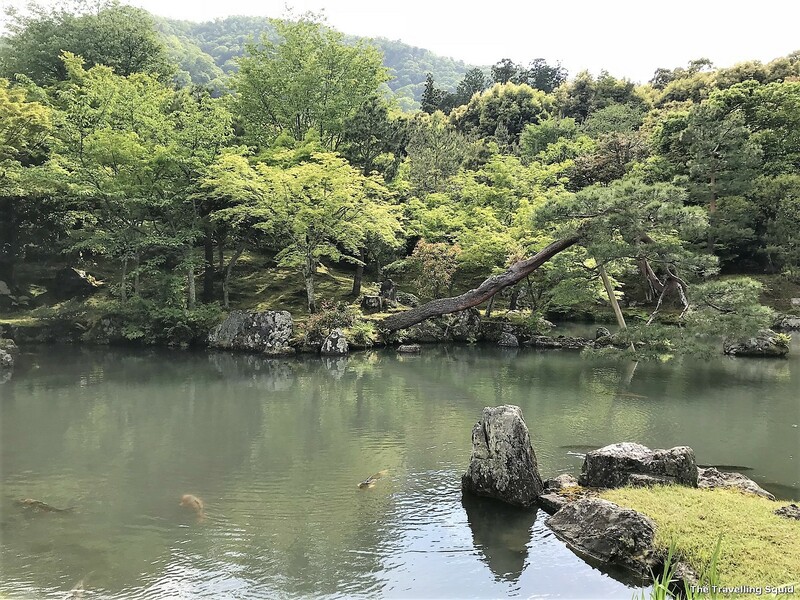 As we were in search for more bamboo trees to take pictures with, we also came across an immaculate Japanese Garden by the side of the Tenryuji Temple. There was a tree drooping into the lake in a natural yet artistic fashion. It was like a scene from a painting. Some hard work must have gone into getting the tree to droop down. 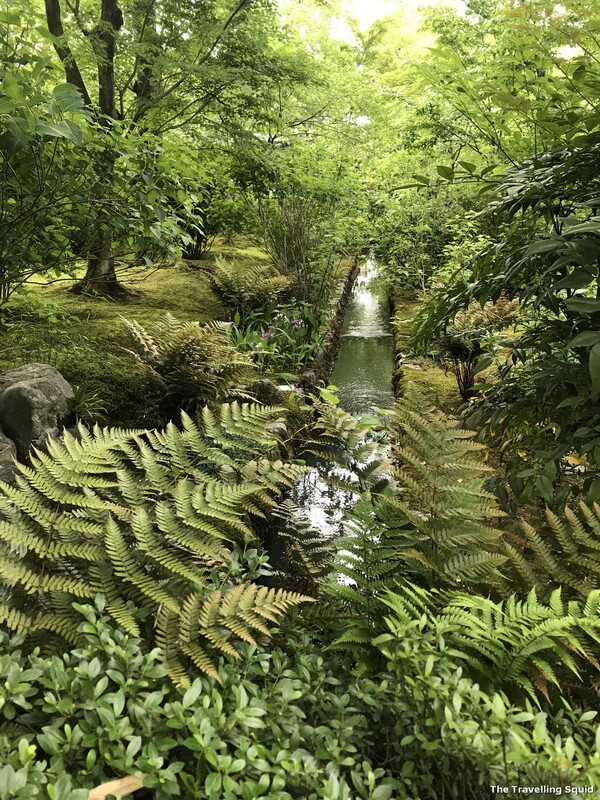 I’ve taken a panorama of the garden because it felt so ‘Japanese’. Each bush was well taken care of and the angle of the tree had to be perfect. The branch slanting to one side, almost like it was going to fall into the pond – I’m pretty sure it’s intentional. The pebbles were also raked in an orderly fashion. There was no such thing as leaving the landscape to chance. I did not expect to find such a man-made yet pretty garden in the Arashiyama Bamboo Forest in Kyoto. 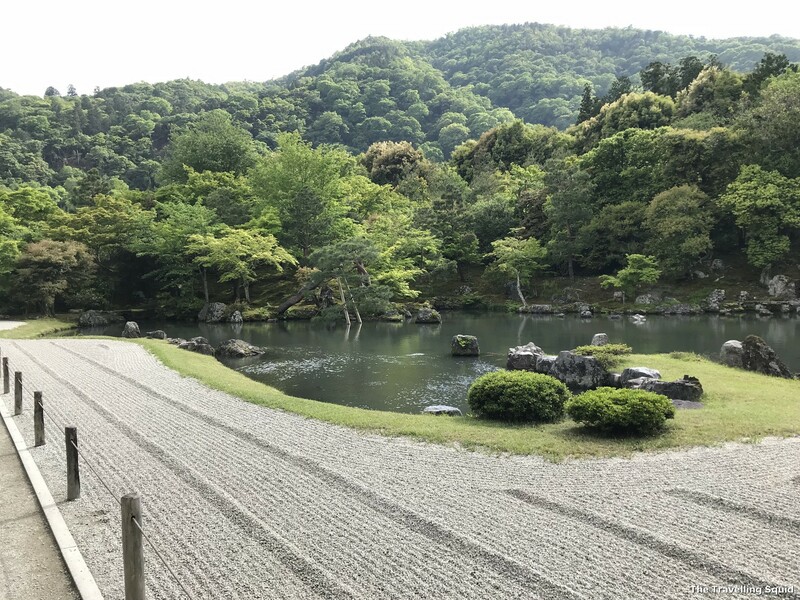 The line of pebbles – apparently it’s quite a Japanese thing. Despite the pun, I’m pretty serious about this. 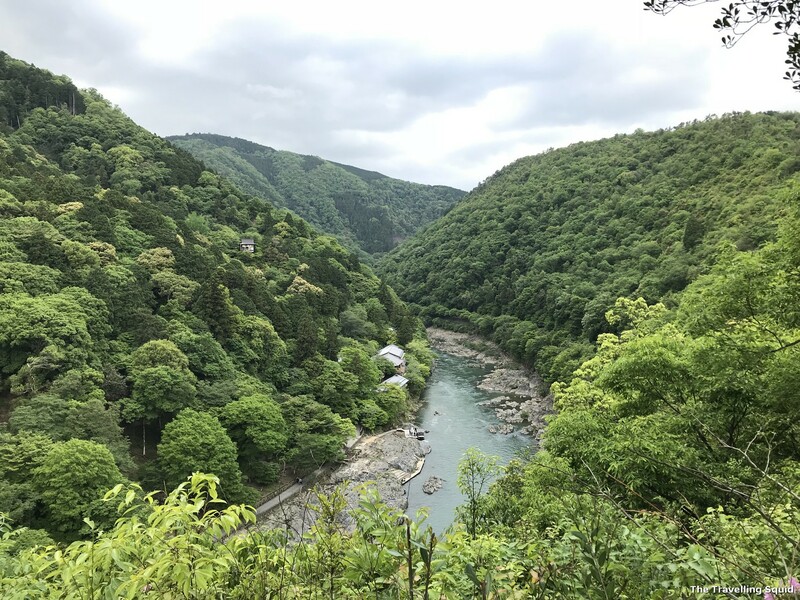 While we were trying to locate the exit of the Arashiyama Bamboo Forest, we came across a clearing with a beautiful gorge laid before us. There were one or two small houses along the edge of the hills. It was truly beautiful! It was quite a bummer to later see that the gorge led to the river bank. The river was filled with a number of tourists kayaking on its waters and more tourists lingering by the banks of the river. Lingering by the banks of the river. Pleasure boats and kayaks fill the river. 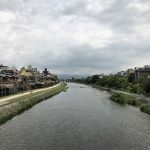 According to CNN, the Togetsukyo Bridge was built during Japan’s Heian Period (794-1185), when Kyoto was Japan’s capital, it was reconstructed in the 1930s. Today, many restaurants, shops and cafes have emerged in surrounding areas. 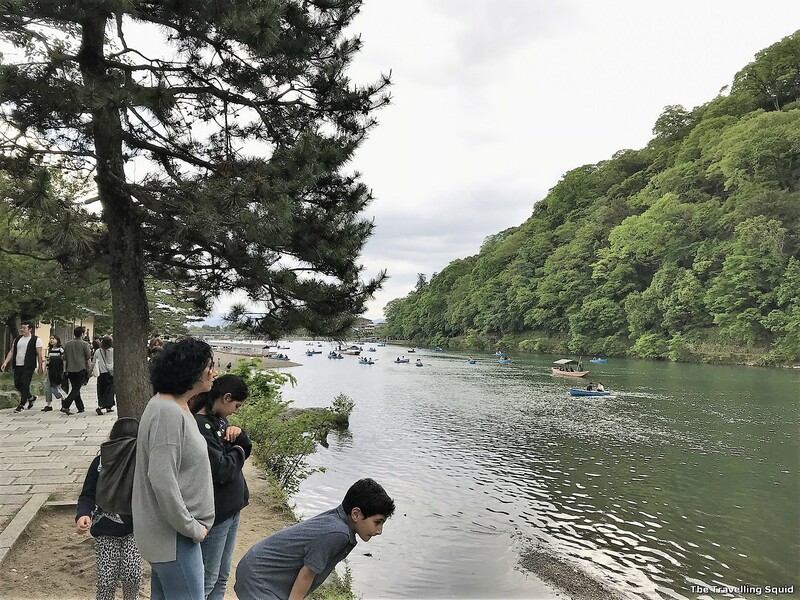 You’ll find many people taking photos against the backdrop of the Hozu River, some of them clad in kimonos. 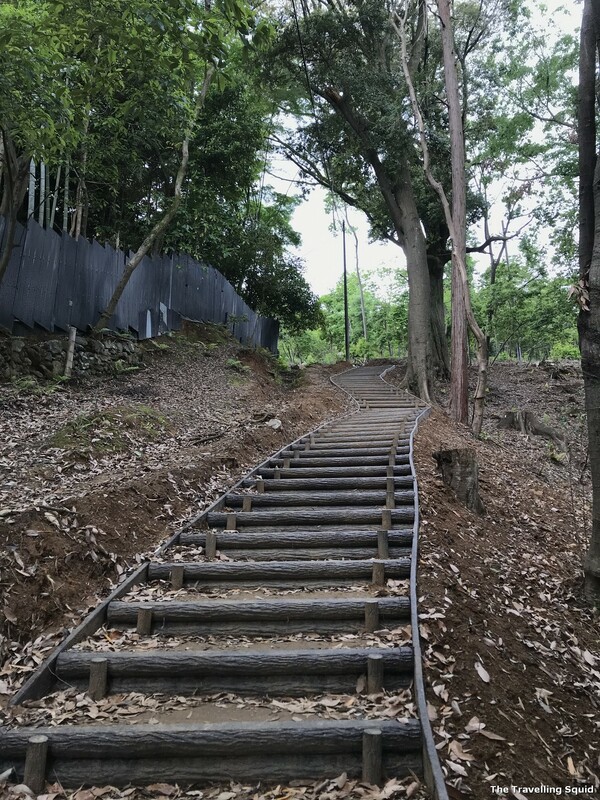 During our way down the hills of Arashiyama, we spotted two kimono-clad ladies decked in traditional Japanese slippers (with white socks), walking gingerly down the wet steps of the Arashiyama Bamboo Forest. Upon seeing them, I was glad for my pair of sneakers. 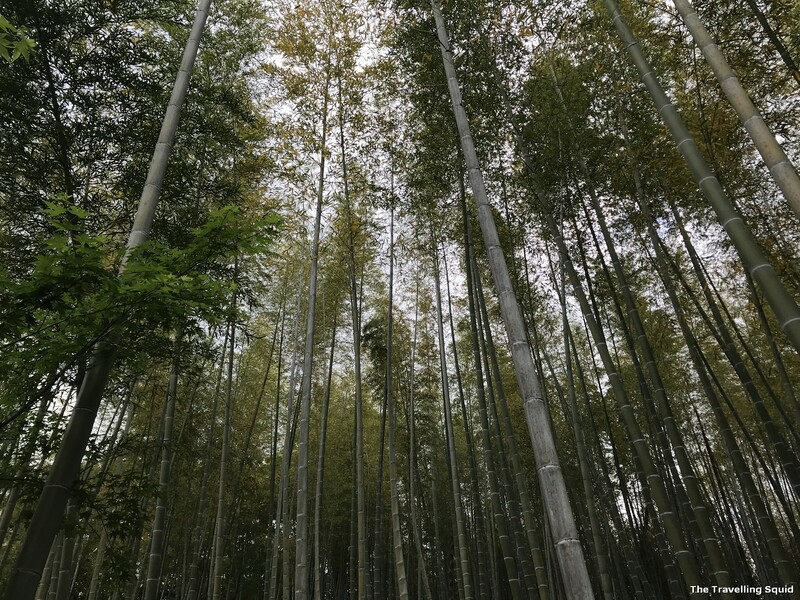 The Arashiyama Bamboo Forest in Kyoto is possibly not the only one in Japan. I believe the Arashiyama Bamboo Forest in Kyoto is not the only bamboo forest in Japan. 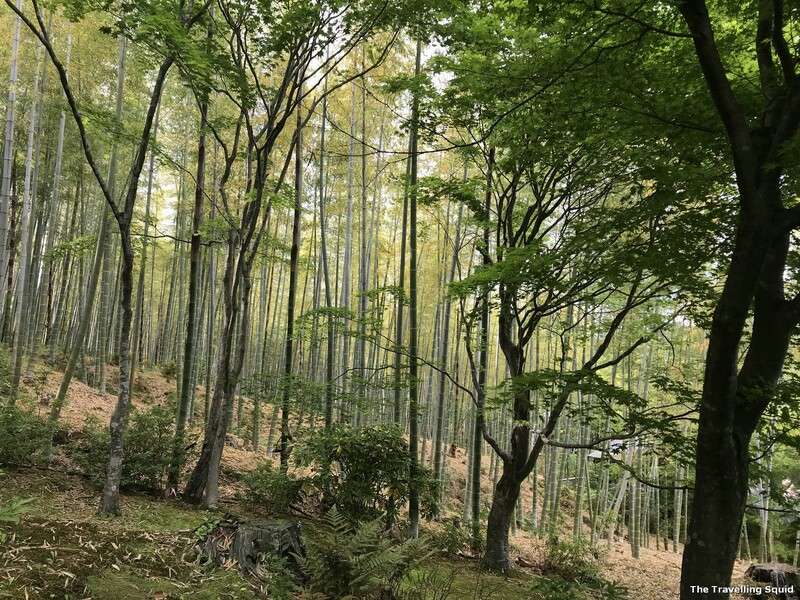 I’m pretty sure that there are many more of such forests which lie in the more remote hills in Japan, enjoyed by villagers and people living in the area. It could be a place which they frequent every day, on the way to school or work and back. Or simply, a path they use to visit a neighbour’s house. For a non-Japanese speaker like myself, I’ve come to accept that I may never find such places, off the beaten track. Perhaps if I did some in-depth research I would. But the biggest perk about visiting the Arashiyama Bamboo Forest in Kyoto is its accessibility. 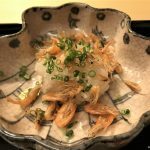 From Higashiyama, I’d simply take a bus to Kyoto Station and a local train from there. 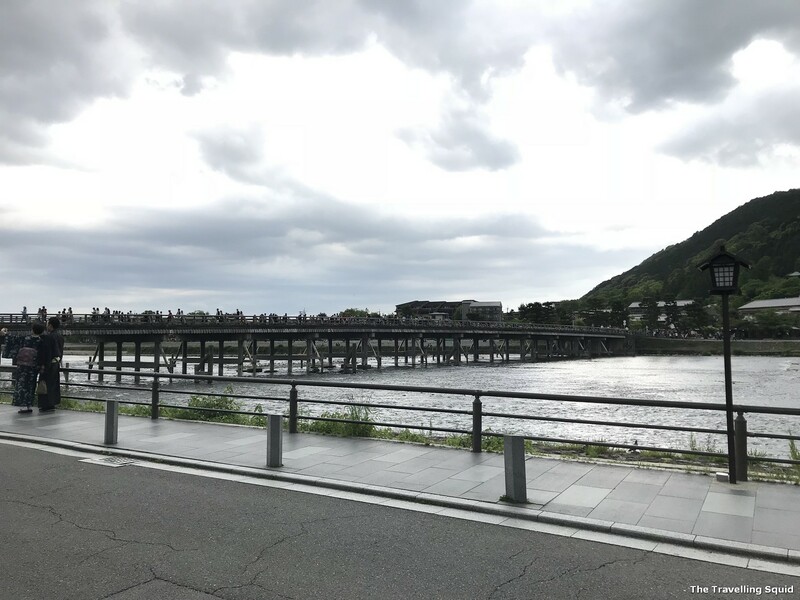 The Arashiyama Bamboo Forest is a short 10 minute walk from the JR San-In line, which stops at the Saga-Arashiyama Station. While it was crowded, the sights were beautiful and it was a walk to remember. Stay tune for the next post on the recommended walking route for the Arashiyama Bamboo Forest in Kyoto! 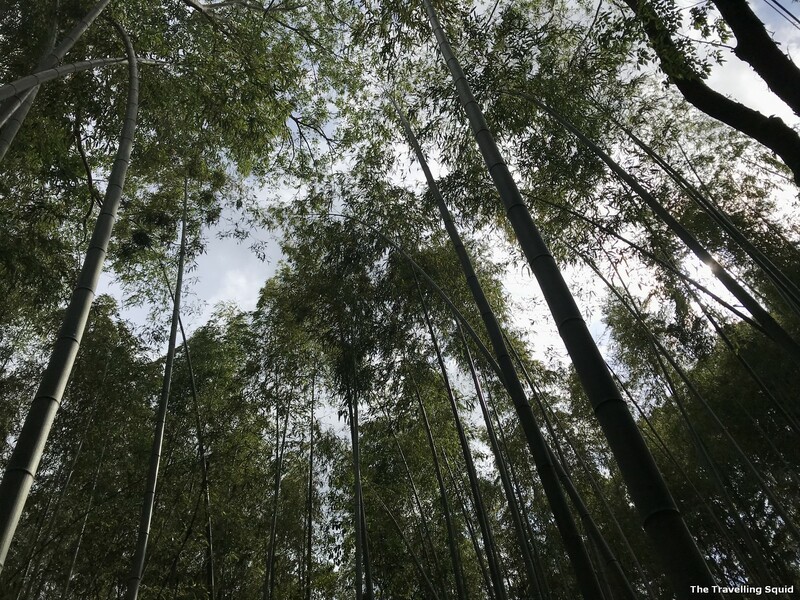 3 Responses to "Five things to know about the Arashiyama Bamboo Forest in Kyoto (Part 1)"